The Swedish label Sterling, which specializes in orchestral music from the Romantic era, always manages to pique interest, presenting rare repertoire by unknown and unsung composers. This is indeed welcome by those, like myself, who have a desire to venture off the beaten track. 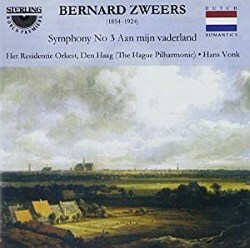 I have to admit that I’ve never encountered the music of the Dutch composer Bernard Zweers before, though this is the third release of his music by Sterling. The Symphony No. 3 Aan mijn vaderland (‘To My Country’) is regarded by many as his masterpiece, so it’s rather surprising that it hasn’t been given more air time. I see that this 1977 recording, originally on LP, has had a previous CD incarnation on Olympia in their 400 Years of Dutch Music series (OCD503), coupled with Theodoor Verhey’s Flute Concerto. Zweers was born in Amsterdam in 1854, and probably owed his musical awakening to his father, a music-dealer who conducted, sang and played the piano. Bernard started to compose at the age of fourteen. His father didn’t approve of his son’s musical interests, wanting him to join him in the family business. The determined son wasn’t to be deterred, however, and after some self-tuition his perseverance paid off and he was sent to study with Salomon Jadassohn in Leipzig in 1881-1883. It was at this time that he composed his First Symphony. He also attended the Berlin premiere of the Ring des Nibelungen in 1881 declaring, on his return, that he was ‘a full-blooded Wagnerian’. In 1885 he began teaching composition at the Amsterdam Conservatory, a post he held until 1922. He died in 1924. His tastes lent towards vocal music, but he also has three symphonies to his name, some incidental music and an overture. His music combines Dutch folk elements and Wagnerian stylistic characterisations. Rob Barnett, in his review of this recording, remarked on the Third Symphony’s Brucknerian proportions. Cast in four lengthy movements: (I In the Dutch forests; II In the country; III On the beach and at sea; IV To the capital), it calls for large orchestral forces, including a four-piece saxhorn section. Leaving behind the Germanic influence of the first two symphonies, Zweers adopts a more nationalistic stance in this work with Tchaikovsky, Dvorak, Rimsky-Korsakov and Glazunov discernible influences. Melody and lyricism are in generous supply, and I love, for instance, the light-hearted geniality of the second movement Scherzo. The symphony could almost stand as four independent tone-poems. Zweers' deft orchestration is particularly colourful and evocative, with some delightful woodwind writing. Despite the age of the recording, it sounds extremely fine, with some exquisite orchestral textures and colours surfacing. Vonk and the Hague Philharmonic have been warmly recorded, and are worthy champions of this compelling score. For me, this has been an exciting discovery, and I shall attempt to seek out Symphonies 1 (review) and 2 (review) as a result.